Not everyone wants long hair. Not everyone wants short hair either, and if we are being completely honest, not everyone wants to wait for the perfect style and shape to grow into existence. No one says we have to wait for everything when it comes to our hair. Yes, we need to be patient but there are ways to get around some common problems without drastic measures like cutting, permanent dye, or using straighteners. Naturalchelz from Curly Q&A recently reached out to us about getting a desired shape without taking drastic measures. Do I have to cut my hair? In October I will be one year natural so I understand that hair takes time to grow, but do I have to cut my hair in order for it to have shape? If not how to I shape and stretch it? No, you do not have to cut your hair to give it a desired shape. In a nutshell, fake it until you make it! Shaping curly and coily hair can be somewhat of a challenge, especially if you are not sure about cutting it all off or if that will even give you the desired look. Many newly naturals are transitioning and while they are willing to work with two very different textures, that does not mean they do not want a stylish ‘do’ as they grow out the relaxed ends. Of course rocking braids, wigs or weaves is an obvious solution if one is trying to grow out their transitioned hair and want options, but that is not for everyone and like Naturalchelz, some are ready to fully embrace curly or coily styles with their own tresses. Naturalchelz is interested in the popular heart-shaped big hair afro style. Who can blame her? It’s gorgeous! The secret to this beautiful style is more about technique than it is about length, so there is no need for scissors. Here are tutorials for achieving the style of your dreams. Kasheera from Kash TV shares how to rock this style with a wash and go. What I really love about this video is how she delicately manipulates her hair to achieve the look she desires. She lets the shrinkage work to her advantage. This is perfect for someone who has longer hair in the front, but is even better if you do not. It is all about creating the look without pulling out the scissors. Watch her mold her afro. 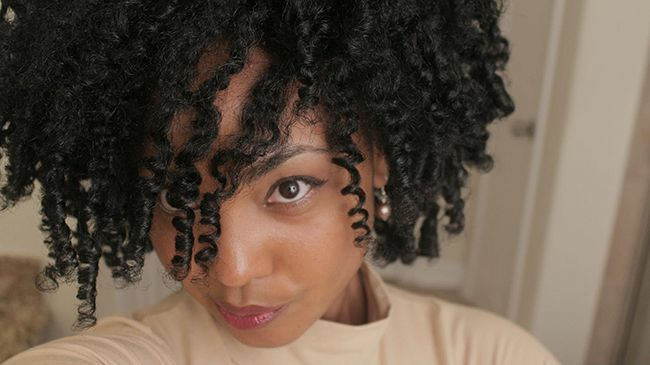 Eugenia Say shares how she gets her ultra-shiny heart or strawberry shaped twist out! It is all about technique, as she lifts her crown to get it perfect. Can I just add that her personality is so loving and fun? Ok, this video will give you step-by-step directions on how your regular twist out can be a heart-shaped full of lovely with a few lifts from a wide tooth comb. Now, if bigger hair is more important, then adding extensions can create this effect. It is in molding your hair to the shape as the key element and scissors be damned!